UNIQUE, MEMORABLE & FLEXIBLE LOGO DESIGNS. A great logo design needs to resonate with users on first glance for it to truly be memorable. Having brand recognition among audiences will help build familiarity and increase both your brand’s trust and credibility in the marketplace. For many, the first impression of your business is your logo. We design logos that speak to your audience and communicate your company values. Your logo should build trust and be memorable to your audience. A well-designed logo can take your company to the next level. At Shared Marketing, we are well versed in creating great first impressions. Our team of graphic designers and marketers have the skill, experience and passion essential to capturing your business’ personality and presenting it a modern, clean and effective logo design. 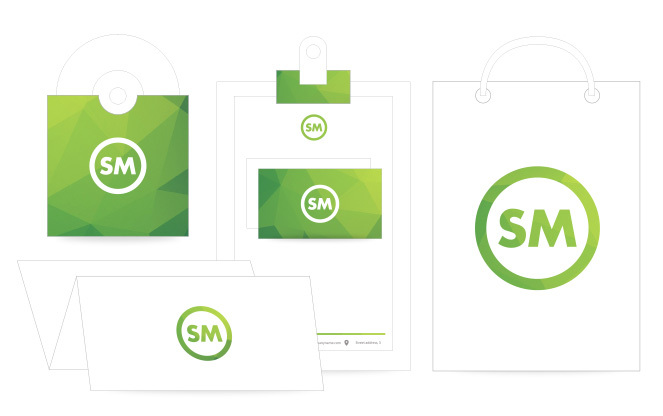 Whether you need a refresh or a rebrand, your logo will put a face to your business and a valuable presence in the marketplace. 1. A Logo Should be Unique. Your logo design should stand out in the marketplace and be instantly recognizable by your audience. Staying away from generic, overused visuals or icons is a great way to do this. While your logo should convey what makes your business unique, it doesn’t necessarily have to illustrate the product or service you provide. Using high quality, professional fonts and typography can also help your brand look unique, while adding credibility to the design. 2. A Logo Should be Memorable. A great logo design needs to resonate with users on first glance for it to truly be memorable. Having brand recognition among audiences will help build familiarity and increase both your brand’s trust and credibility in the marketplace. Using a great logo design in tandem with great marketing will help your brand create relevant associations with your business among audiences and also make your brand a serious competitor in your industry’s marketplace. 3. A Logo Should be Flexible. A strong logo should translate well across a variety of different media. A logo design that looks fantastic on a website should also impress potential clients that receive your business card or see your logo on a large billboard. This means that your logo should be optimized for every channel on which it could be presented so that you can avoid blurry images or other sizing problems. If your logo does not make the transition from one medium to another flawlessly, your company’s legitimacy could suffer. 4. A Logo Should be Illustrative. Even though your logo design doesn’t have to directly show to your products or services, it should reflect something about your company’s values or culture. Ideally your company’s culture resonates with the thoughts or beliefs of your target audience. Understanding and defining your target audience will go a long way towards being able to craft an effective and appropriate logo for your brand that resonates with your audience and helps add legitimacy to your business. Part of creating a captivating logo is choosing an appropriate colour that helps conjure the emotions you want from viewers. 5. A Logo Should be Simple. Effective logo designs rely on simplicity. The best logo designs are simple and work well with colour and text but are also easily recognizable by audiences without them. Adding extra effects or text to a website design can distract audiences from your iconic imagery and cheapen the design. They can also detract in a big way for icons that feature unreadable text due to small font size. Do you need a new logo or a logo update?